Banshee is an open-source media player, originally called Sonance until 2005.Built upon Mono and Gtk#, it uses the Helix and GStreamer multimedia platform for encoding and decoding various media formats, including Ogg Vorbis, MP3 and FLAC. 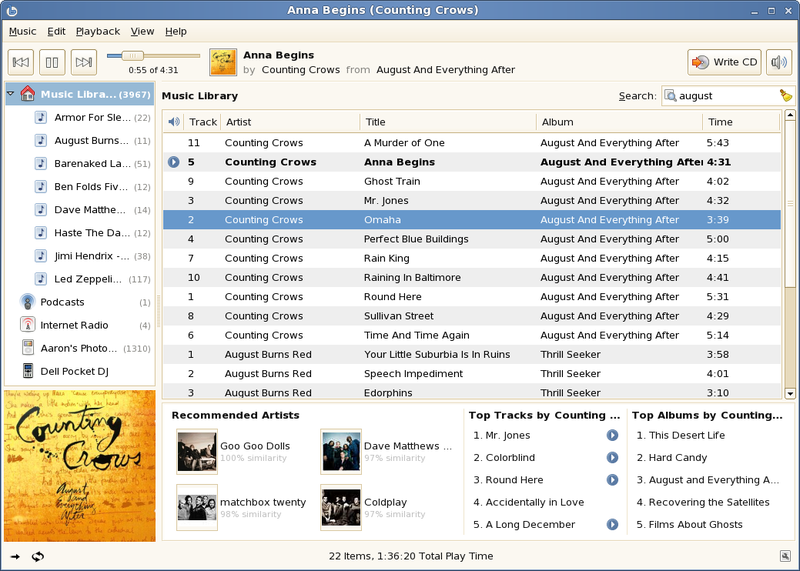 Banshee can play and import audio CDs and supports many portable media players, including Apple's iPod, Android devices and Creative's ZEN players. Other features include Last.fm integration, album artwork fetching, smart playlists and podcast support. Banshee is released under the terms of the MIT License and is available for Linux as well as Mac OS X operating systems. A build for Windows is currently in preparation (see Cross platform support). Banshee 1.9.3 is a development release, part of the 1.9.x series leading up to Banshee 2.0. Apple’s iPod support is lackluster to say the least. You can’t sync desired playlists but the entire collection, or select only one playlist, wich is not of much help. This is not what most users need. Can’t download Banshee neither Ubuntu’s download manager or terminal download work. It says something about dependencies and uninstallable packages.